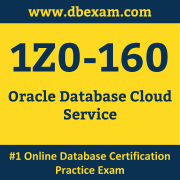 You can easily pass 1Z0-160 Oracle Database Cloud Service Certification with the help of our online practice exam. At oraclestudy.com, we are here to help you in clearing your Oracle 1Z0-160 certification exam. Our team of experienced and certified Oracle professionals with more than 12 years of experience in Oracle Technology has designed this practice exam. We have carefully maintained exam structure, exam syllabus, exam duration and passing score same as actual Oracle 1Z0-160 certification exam. Our online practice exam contains practical and case study based questions. These questions are the most frequently asked in actual Oracle Database Cloud Service (1Z0-160) certification exam for Oracle Database Cloud Service Operations Certified Associate (OCA) credential. At oraclestudy.com, we believe in "The More You Try, The More Confidence You Gain", please try our sample practice exam to build the trust. All the questions covered in sample exam are basic Oracle Database Cloud Service (1Z0-160) certification exam questions. However, we strongly recommend practicing with our Premium 1Z0-160 practice exam, because you may get more practical and real time scenario based questions in your actual Oracle 1Z0-160 Certification exam. We have designed each question more comprehensive and exam oriented. Below are the advantages and features of Premium Practice Exam Membership. 95+ Practical and Real Time Scenario Based Certification Questions similar to actual certification exam and their correct answers for assessment. 2 Months Unlimited Access to online Oracle 1Z0-160 certification practice exam. Multiple Choice Questions to be completed in the Specified Time Duration. Questions are Updated for latest Body of Knowledge and certification test pattern; it means our questions are fit for all upcoming exams. Personalized Result Book to Track Your Progress. Result History with attended questions and answers. Safe & Secure Payment with 2Checkout payment gateway. Price is just $26.90 USD, lowest compared to any other online or offline materials. Payments accepted through Credit Card, Debit Card and PayPal. 100% Money Back Guarantee if you can not clear your exam in the first attempt. We have a dedicated team of Oracle certified experts who are having more than 12 years of experience on Oracle technology. Our structured and autonomous review system collects feedback and exam experience from recently certified candidates, based on those inputs our domain experts frequently update 1Z0-160 test questions for practice. Our online practice exam is the exact match of actual Oracle Database Cloud Service certification exam for Oracle Database Cloud Service Operations Certified Associate (OCA) credential that trains you to complete exam within the time duration. We offer an unlimited attempt to practice with our online full/mini practice exam. Each exam attempt fetches random 70 questions(full)/35 questions(mini) from our premium question bank that contains 95+ most probable premium questions prepared by our domain experts. Every time you will face questions in random order with shuffled multiple choice answers to make your exam experience more challenging. You can view your result of each exam and performance history of your past attempts. Such facilities are the great advancement over questions set in PDF and far better than fraud dumps sites. According to our survey with Oracle certified candidates, one can easily score 80% in actual Oracle Platform as a Service (PaaS) 1Z0-160 certification for Oracle Database Cloud Service Operations Certified Associate (OCA) credential, if he or she can able to score 100% in our online practice exam. Happy that i received 77%. 1z0 160 Oracle Database Cloud Question Bank through the membership on dbexam. By practicing repeatedly, it helped me gain in-depth knowledge of every area and made me an expert. There is nothing like this that i came across during my research for Oracle Database Cloud certification exam preparation on the dbexam it is the best i got in the lot. 1Z0-160 simulated tests helped me understand how to clear the actual exam.